Performers include: Dwayne “Dog” Chapman, Leland Chapman, Tim Chapman, Beth Smith, and Justin Bihag. This real-life series details the job of bounty hunter Duane “Dog” Chapman at his Da Kline Bail Bonds facilities in Honolulu, Hawaii, and Denver, Colorado. Dog catches fugitives with the help of his business partner and wife, Beth Smith Chapman, sons Leland and Duane Lee, daughter “Baby” Lyssa Chapman, nephew Justin Bilhag, and associate Tim Chapman. Dog knows firsthand the position of the criminals he seeks as he himself was once jailed for armed robbery and first-degree murder. The show tells the story of how Dog became a bounty hunter when he admitted to a judge that he was unable to pay child support. The judge offered Dog a deal; if he could capture a fugitive, the judge would pay part of Dog’s child support in return. Dog now has 12 children to look after and while the series follows him and his company in their search for fugitive drug dealers and arsonists, it also profiles Dog’s journey as a father. To Dog, finding a clown for his son’s birthday party or picking up the right flowers for his wife on their anniversary are just as important (if not more important) than bringing a criminal to justice. The show began after Dog’s appearance on Take This Job, a show that profiles people with unique and interesting careers. Dog’s target for today was once an upstanding member of his community. Now with no home, no job and the law on his trail, this middle-aged exile from middle-class society is using the cold end of an ice pipe to soothe his troubled soul. But Dog also has new trouble brewing inside his own family. First aired: June 23, 2012. What do you think? Will you miss Dog and his crew? I miss Dog, Beth and the rest of the family. It was a great show and I always looked forward to watching it. Bring them back. I WATCHED DOG AND FAMILY EVERY DAY, I TRULY LOVE THE SHOW. IT NEEDS TO BE PUT BACK ON THE AIR.. THIS IS ABOUT THE GOOD GUYS GETTING THE BAD GUYS. WAKE UP GUYS THIS WAS A GOOD ONE. I love Dog the Bounty Hunter. I watch it every morning while getting ready for work! Please bring them back! I love this show. My kid and I lived to sit and watch it. I will miss the chapmen family so much. 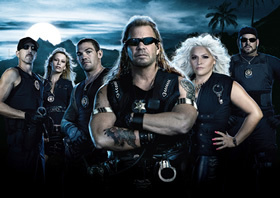 Bring back “Dog: The Bounty Hunter”! You guys are the best and really all need to work together as a family. I live in the U.K. and watch it every Sunday. It wouldnt be the same if you didnt all work together. Its excellent the way you keep finding all the perps. Love watching it.